Several years ago, I was a part of the PNC at my church. What is a PNC? Well, that is the Pastor Nominating Committee. We were a group of seven church members who spent the better part of a year searching for a new minister. It was a long process, involving such tasks as reading the bios of almost 200 pastors, but I am happy to say that we succeeded. We found Connie, and what is most amazing, is that she lived only a few miles away. Connie came to our church when we were struggling. She willingly accepted the challenges we presented to her and has worked fervently over the last two years to unite us, to teach us, to show us how to be the best version of ourselves. It occurred to me that as a minister, Connie is always tending to the needs of others – and we do have about 150 people in our congregation. And then I wondered, who tends to the needs of the minister? 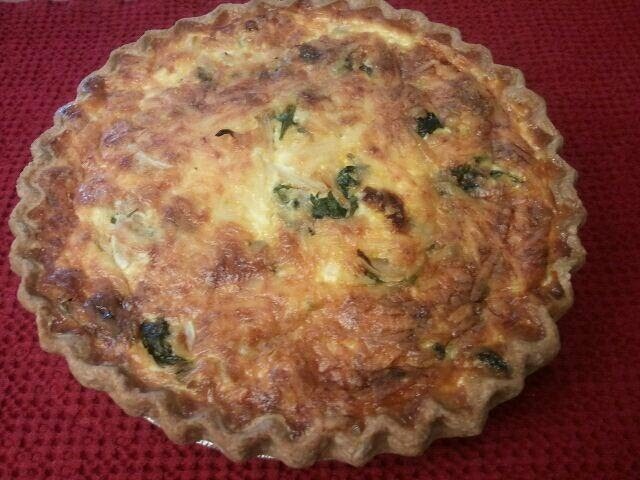 Today I delivered a spinach, onion and sun-dried tomato quiche to Connie. I want to thank her for her many hours of work on behalf of our congregation – and I want her to know that we appreciate her very much. Thank you, Karen, for your service . . . your service in our great community; your service to the church that goes far beyond what most people know (PNC, Parish Life, speaking up when needed, tending to many needs, etc., etc. ); your service of baking and giving pies that brings a new view of community. Thank you, too, for recognizing that pastors serve others willingly and are unsung and forgotten when it comes to handing out tokens of thanks or appreciation. Sometimes, if they do their job, they push us beyond our comfort zones . . . so thank you for thanking Connie!! And for your part in bringing her into service at First Pres. Ashland. Thanks Wendy for your very kind words – and for noticing. I appreciate your support! Karen, I feel so special to be the recipient of one of your delicious pies! The quiche was fantastic and was the highlight of two family dinners! Thank you for thinking of us. It was so delightful to return home and find a piping hot quiche waiting for us.